A new chance for ringside judges to show they’ve got what it takes is being launched at this weekend’s opening qualifier of the FEI Dressage World Cup series in Herning, Denmark. The well-established Spectator Judging smartphone app has been expanded for FEI eLeague Dressage, with fans vying to top the leaderboard and win a VIP trip to the World Cup final. 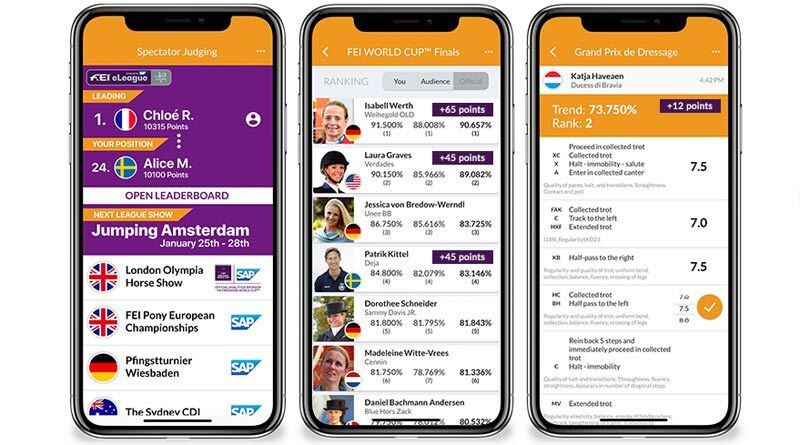 In the new innovation developed with SAP, the Official Analytics Sponsor of the Dressage World Cup, users collect points when taking part in Spectator Judging throughout the Western European League season. Additional options to collect points will be added over time, for example by interacting with the FEI TV channels or posting individual user-generated content. The live leaderboard will display the current ranking of the eLeague participants as well as in the app, so fans can watch their progression. The overall winner will be announced after the last qualifier in the Western European League season, held at ‘s-Hertogenbosch in The Netherlands, in early March. They will receive a VIP trip for two to the FEI Dressage World Cup Final in Gothenburg, Sweden in April, with the chance to go behind the scenes and meet the athletes. “The FEI eLeague Dressage is the future of fan engagement,” FEI Commercial Director Ralph Straus said.